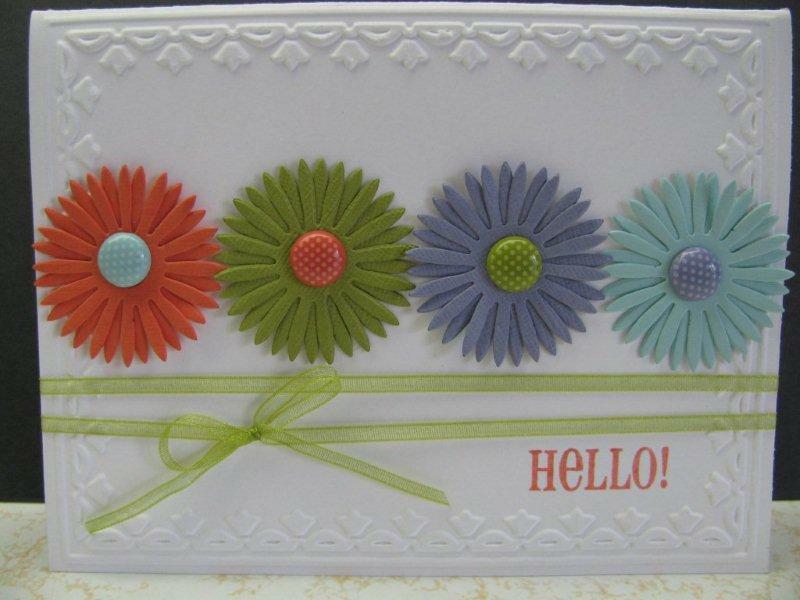 This lovely card is for The Paper Players Sketch Challenge 88 and Color Throwdown 185. 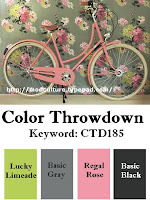 I colored the image with markers using Regal Rose, Lucky Limeade and a touch of Basic Gray. 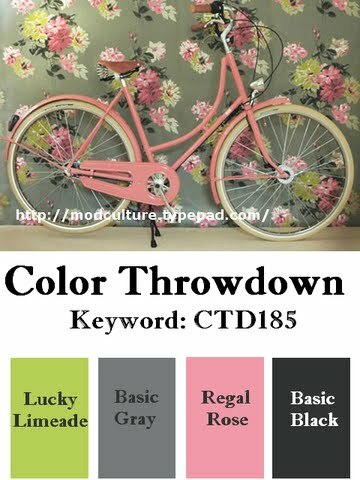 These colors are so fresh and spring-y! I'm pleased with the way the whole thing came together! The backround paper is Lucky Limeade DP and I think the pattern feels vintage and compliments the flower image so nice. I added some Dazzling Diamonds glitter here and there on the flower image to make it sparkle....very girly and fun! 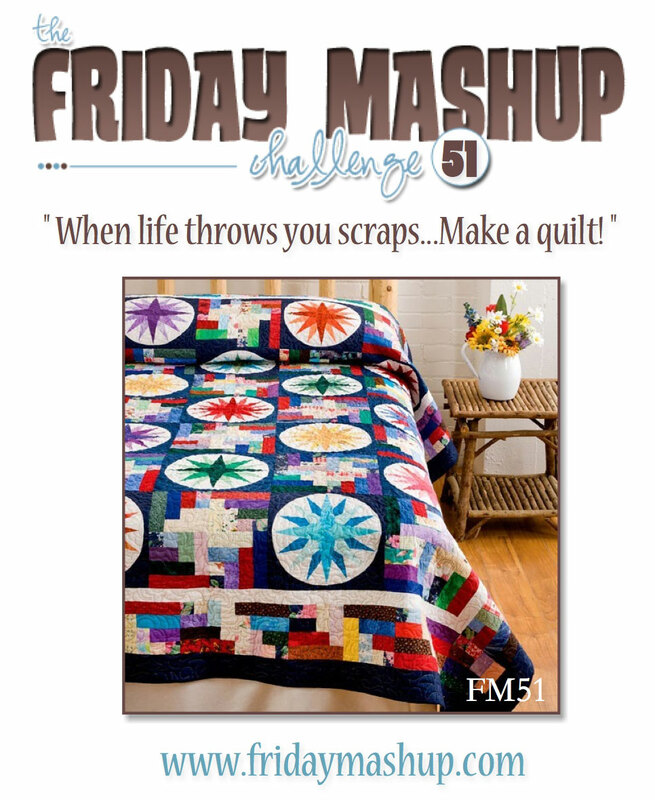 Todays card is for The Friday Mashup #51. 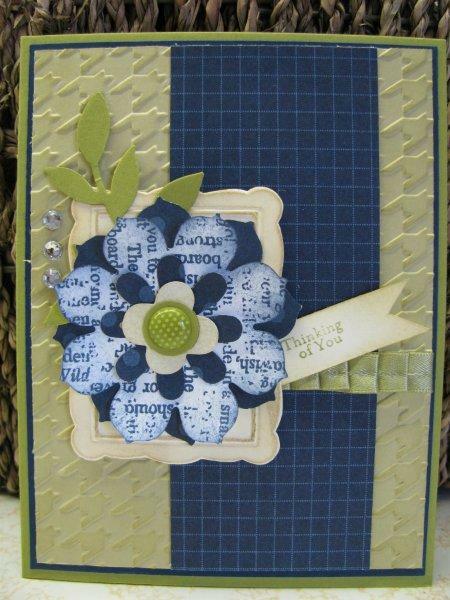 This weeks challenge was to create a quilted card and use scraps that have been forgotten. I just love this herringbone technique. 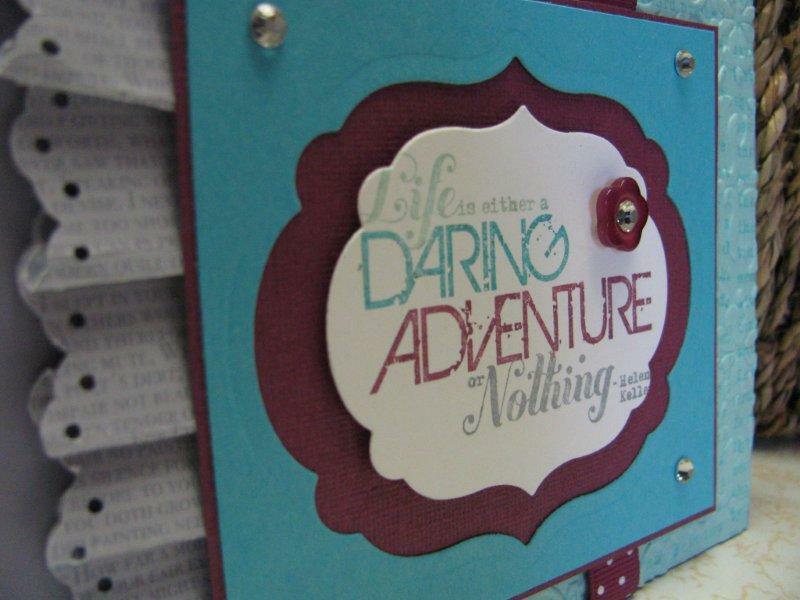 It is really fun to create and always gives stunning results. I've had this patterned paper in my stash for a couple of years now and just havn't used it much. I believe it's from K & Company. I remember picking out in the store and thinking at the time that I could do so many things with it. I guess that was not to be, because once I got it home it just sat. 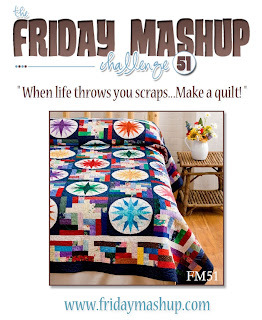 The Friday Mashup Challenge was the perfect place to put this paper to use and I'm thrilled with the results! 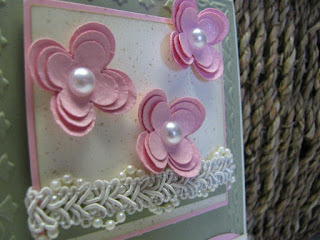 For the finishing touch, I cut two little flowers from the Blossom Party die and misted them both with Champagne Shimmer mist. This adds so much to any card. I made my own shimmer mist by mixing 1 part shimmer paint to 2 parts rubbing alcohol. I mixed them up in a little mister bottle and voila! Champagne Shimmer mist! 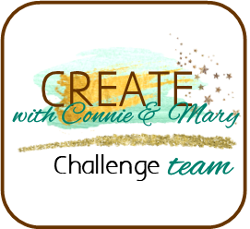 I just had to enter this card for Create with Connie and Mary Sketch Challenge 194 also! These flowers were yet again a project that had been sitting on my desk for ages just waiting to get used. I made them using the watercolor bleed technique. 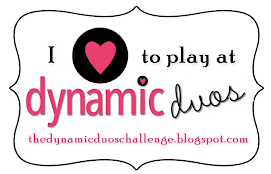 It is soooo much fun! If you havn't tried it, you simply must. The results are always fabulous! The technique calls for reinkers and my stash is limited, but I used what I had and I'm in love with the final product. For these particular flowers I used Bashful Blue and Pretty in Pink. 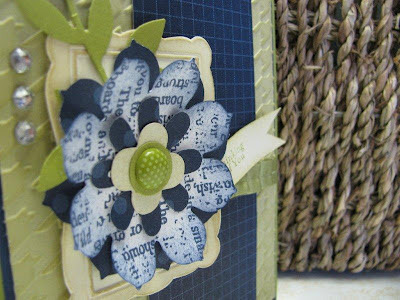 The link to the technique should lead you over to Splitcoaststampers and you can follow the step-by-step instructions there! Fun, fun, fun! I used white shimmer paper for the flowers because it seems to be a little sturdier than regular white cardstock and the technique calls for you to mist the paper with water. I also sprayed the backround Bashful Blue piece with Champagne Shimmer Paint mist to give even more sparkle, although you can't tell from the photos. I wish it would photograph better because the extra shimmer is so darn pretty! 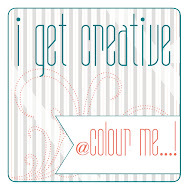 This card is for Create with Connie and Mary Sketch Challenge 194. 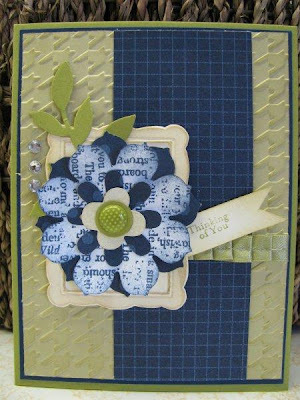 I created the flower panel many weeks ago for another CCMC using Night of Navy, Lucky Limeade, and River Rock, but never used it on the card I made for that challenge. It's been sitting on my desk just waiting to be used in a project. 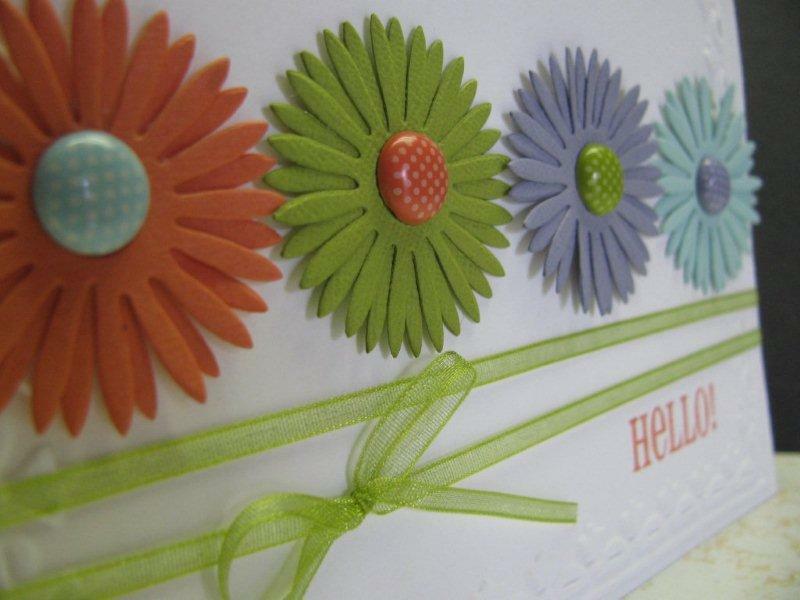 I bet this cute little flower is glad to finally get put to use. 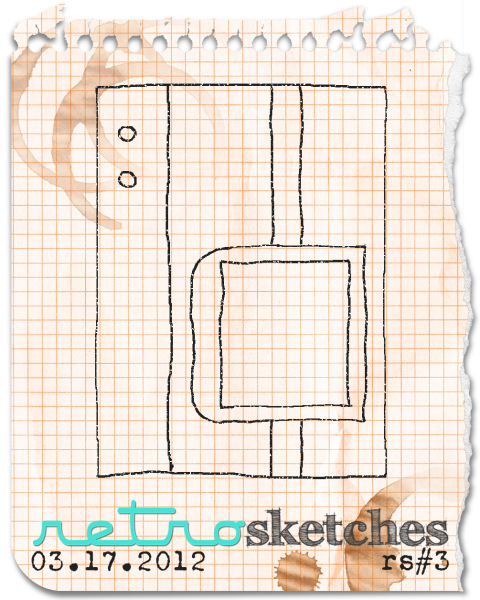 Today's card is for Retro Sketches #3 and Colour Q 129. The color aren't my go to picks, so it was fun to work with. 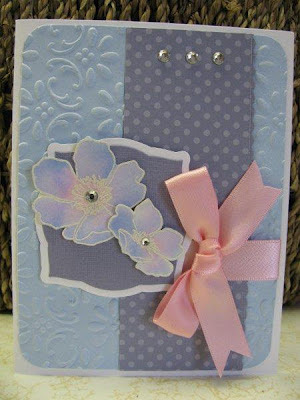 I'm feeling that this could be a girly graduation type card.....that's the direction I was trying to go, anyway! This pretty card is for Just Us Girls Challenge 128 using soft pink, moss green and cream. 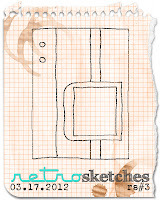 I also used the Saturday Sketch Challenge 247 sketch from Stamping 411. I used the Floral Fusion die and sprayed all three flowers with sparkle mist, then added a half pearl in the center of each. I also layed each flower out on my soft mat pack mat and used a stylus, rolling it around in circles, to break down the fibers in the paper giving the flowers a little shape. 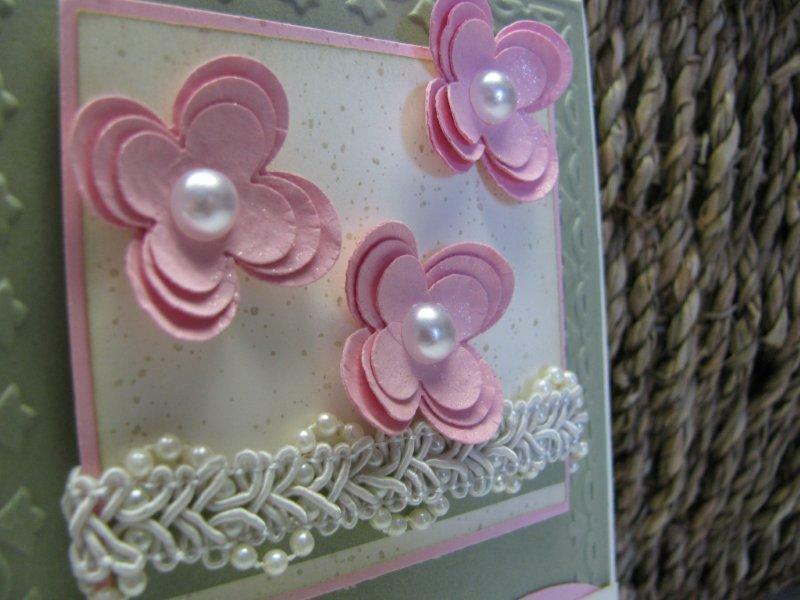 I also wanted to incorporate some of the newest ribbon I bought, this neat braided pearl ribbon from Wal-Mart. It looks antique-ish and I thought it would go nice with this color scheme, plus it was perfect for the little band for the bottom of the main panel on the sketch. 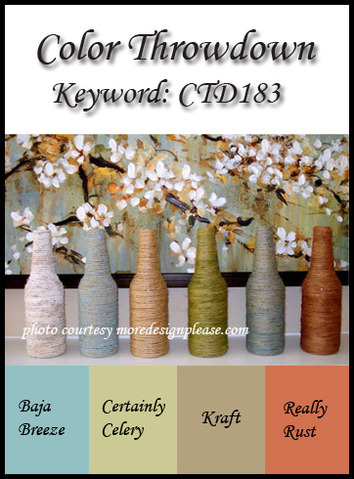 Here's my try for Color Throwdown 183 using Really Rust, Crumb Cake, Baja Breeze, and Certainly Celery. 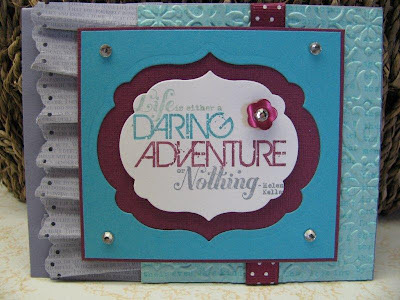 I thought this stamp from the Country Morning set would be the perfect fit for this challenge. 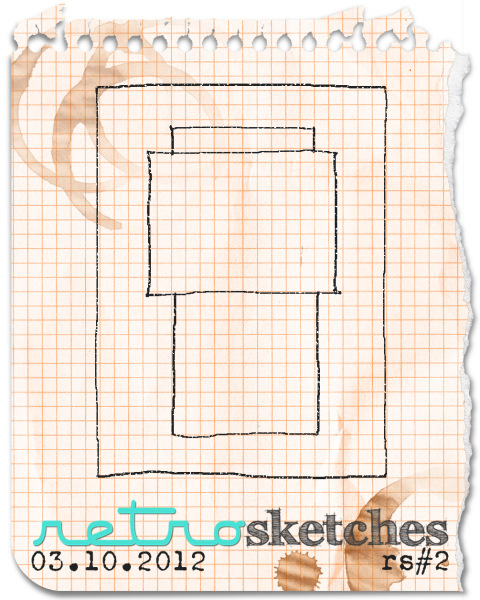 In fact, the inspiration picture kind of reminds me of this stamp a little. I watercolored the image. When it comes to watercoloring, my go to is my watercolor pencils. I find it much easier to blend the colors with the pencils, rather than using ink from my ink pads. 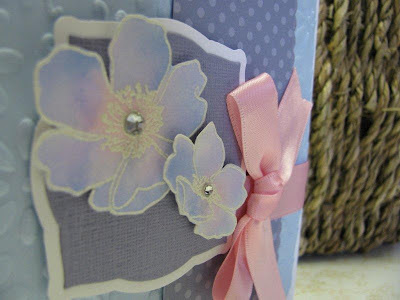 Accessories: Antique brad, twine, soft suede ribbon, stripes EF, Blender Pen, Watercolor pencils. Kites have always been associated with spring for me. I remember getting them for easter as a kid and I've done the same for my boys in the past too. These kites are from a Close To My Heart set called Life Is Good. 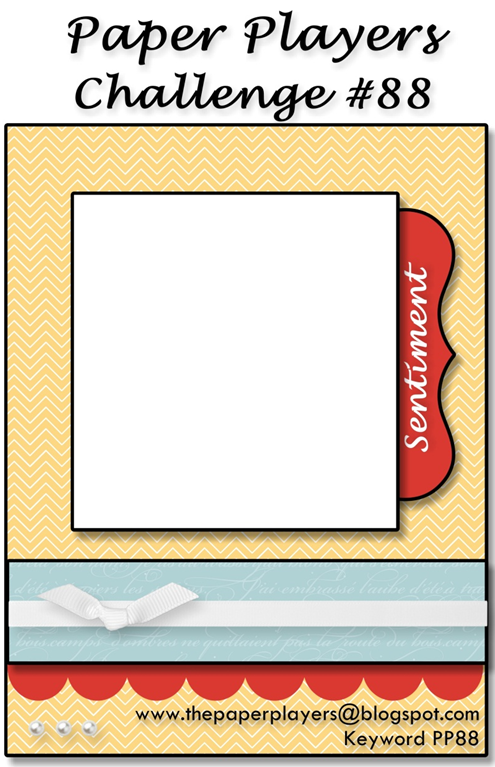 I love the sentiment on this card too. It isn't neccesarily a birthday card, but it could be. 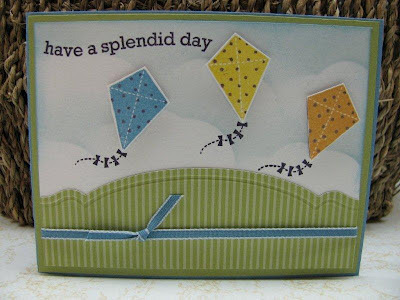 I had seen lots of cards that used the kite and hot air balloon stamps from SU and some of them had this fun grassy knoll made from the new edgelits die and EF, available in the Stampin' Up seasonal mini catalog. I wanted to incorporate the Concord Crush color and I did so by stamping the kites directly over the clouds and then stamping them in individual colors on scrap CS and fussy cutting them out. The kite image is a solid stamp, so again I incorporated the purple by "kissing" a polka-dot stamp inked in Concord Crush onto the kite stamp after it was inked with the main color. I like the effect this gives.....much better than just the plain old solid color. 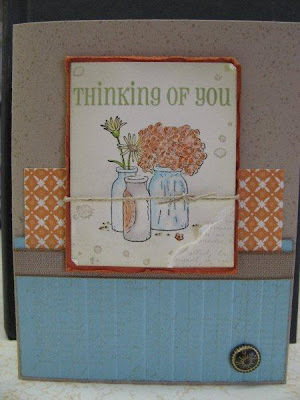 Now the clouds.....I sponged the clouds onto the cardstock by using a template I made myself. I punched out a large oval, positioned it so it was verticle (like an egg standing up on end), then punched two more circles in different sizes. 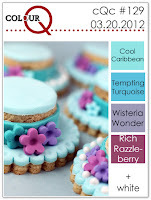 I attached those on either side of the oval and voila! 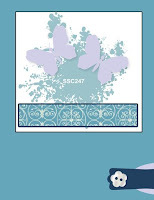 There is my cloud template! I tried to upload a picture of it, but my computer is giving me trouble....darn it anyway! 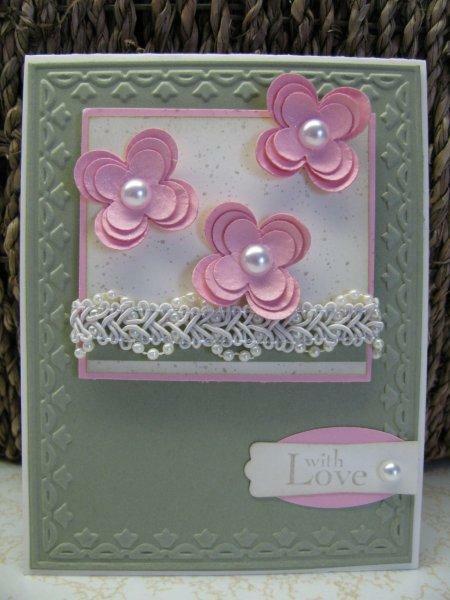 Here's a list of supplies I used on this card. 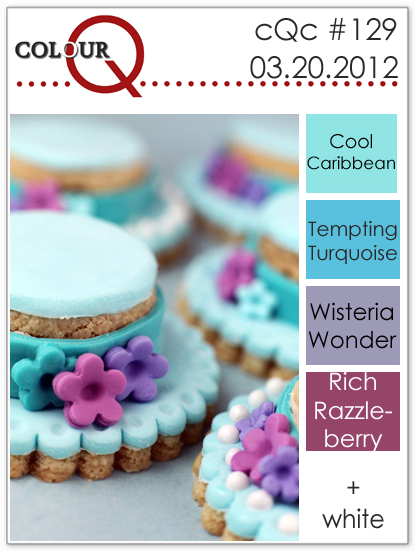 I wanted to make a card for The Paper Players color challenge 86 because the pallette was so soft and pretty. 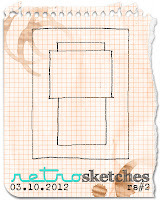 I used the Retro Sketches #2 sketch again. 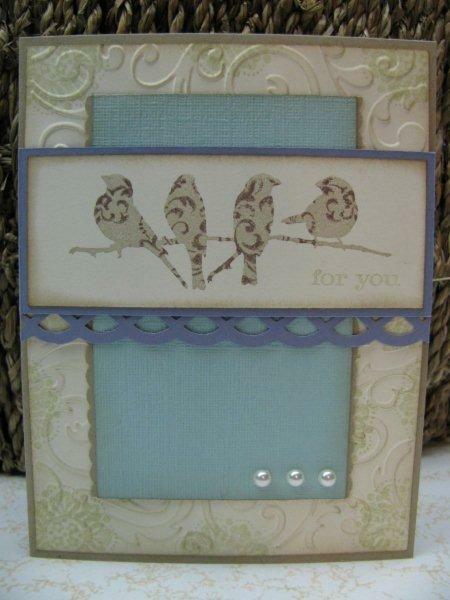 I thought the layout lent itself nicely to this bird stamp. 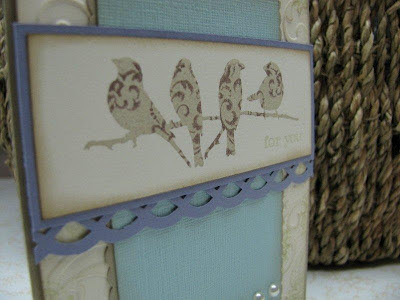 The birds are a solid stamp and I wanted to give them some interest, so I used the kissing technique. I inked the birds in Sahara Sand and then inked up the fancy-scrolly-medalion looking stamp from the Bliss set in Chocolate Chip, kissed them together, then stamped it on a piece of Very Vanilla. Voila! Fancy birds! I really like the way it turned out. You can barely see it in the pic, but I stamped FOR YOU underneath the birds in Celery ink.